Prefer to read with your ears? Listen to the Authentic Brand podcast episode on this topic below. There is a monster plaguing small businesses. It rampages through our marketing materials, and talks smack behind our backs! (Super rude.) This monster is known as the Frankenbrand, and it may be costing you business. Much like Frankenstein’s monster, the Frankenbrand is a brand identity that has been patched together using elements that don’t necessarily complement each other. What results is a disjointed and sometimes horrific display of branding elements that leave your prospects feeling confused and apprehensive about working with you. The Frankenbrand is most common throughout small businesses because as independent entrepreneurs we’ll do everything it takes to grow our business. And this often means doing everything ourselves! We become accountants, bookkeepers, marketing specialists, social media experts… everything under the sun to keep our business running. And then at the end of the day we finally work on our brand, and we’re exhausted. Many small business brands develop over the course of months or years without a clear vision in mind, and that’s when the Frankenbrand starts to emerge. We grab inspiration from too many sources, and cling on to so many ideas, that our brand becomes a conglomerate of conflicting concepts. Thankfully, the Frankenbrand has some weaknesses! 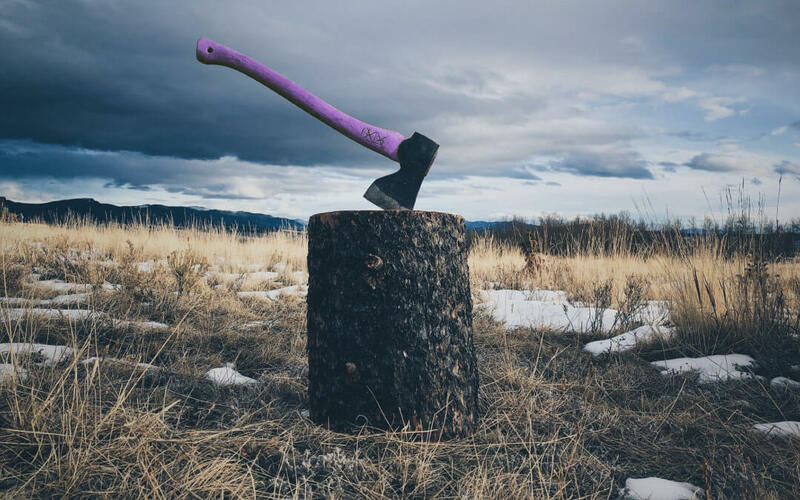 Here are three tactics you can use to take down this monster and boost your brand to new heights. Use all three for maximum success! What makes your brand/business/idea unique. You may start with your personality and hobbies, and then later find yourself diving into deep philosophical subject matter. You may have to tell several stories from your childhood, adolescence and adult life to help me understand really what makes you who you are. And with every person who asks you that question, your answer may vary slightly. You may give that person a completely different set of stories. This is what you’re doing with your brand every day. You’re giving a glimpse into what it represents, why it’s unique and WHY that matters. Your Blueprint helps you keep it consistent and clear. By ensuring each element complements your plan, you can reduce the chance of having a brand that’s been patched together unintentionally. The Frankenbrand thrives on chaos, so combat it with an ultra-clear plan! While your plan looks at the big picture, your guideline focuses on specific scenarios. Your guideline is a set of Rules for Your Brand to Survive the Frankenbrand Apocalypse. These rules come in the form of a brand identity guideline (or style guide). A brand identity guideline is a set of rules for using your brand. It’s one of the most important components of a brand, and also one of the most overlooked. It helps you define your brand, and acts as a guideline for your marketing materials. It’s crucial for keeping the Frankenbrand at bay! Logo. This involves instructions on how to use it, and how not to use it! Brand Colours. Include exact colour codes and acceptable combinations. Fonts. Include font names plus examples of when to use each font. Graphic Elements. Add any special graphics or photographic styles that are okay to use with your brand. Threat Alert! Beware the Frankenbrand Creep. Here’s a special bulletin to bring your attention to a phenomenon I call the “Frankenbrand Creep”. It’s when our dreaded monster stealthily creeps up on us over a period of time. It’s the result of either a) not having a brand identity guideline, or b) having a guideline but not following it to the letter! Example: You’re designing a flyer and so far everything’s gorgeous and brand-aligned. However, you have one last element you want to have stand out on the page. It may be tempting to select a new font, colour or other effect to get the contrast you desire. Beware of this pitfall! If you make an exception to your branding once, it suddenly becomes okay to do it twice, or three times, or fifty times! The next thing you know, the “creep” has set in, and the Frankenbrand is devouring your visual brand identity. Your brand identity guideline will help you make decisions when designing your marketing materials, and will also ensure other people are using your brand consistently. Think of a brand audit as your Frankenbrand Apocalypse Reconnaissance Mission. Now’s the time to dig deep and check up on the status of your brand. Review Your Plan. Think back to your Authentic Brand Blueprint – especially your mission, vision, and values. Are these still an accurate reflection of your business? Since your plan is the foundation of your brand, make sure it’s still strongly tied to your visual identity. Don’t be afraid to make changes as your business evolves. Review Your Guideline. How well have you done in keeping to your brand identity guideline? Are you still consistent with your vision? Is the Frankenbrand Creep starting to set in? Take this time to assess each component of your guide and resolve to keep following it diligently. Again, don’t be afraid to evolve your brand – just make sure it’s done intentionally! Review Customer Feedback. What are people saying about your brand? Ask your audience how they feel when they see your branding – are they feeling what you had hoped? Check in with your customers to see if your brand is still sending the right message. You can perform a brand audit on your own, with employees, or by consulting a branding expert. 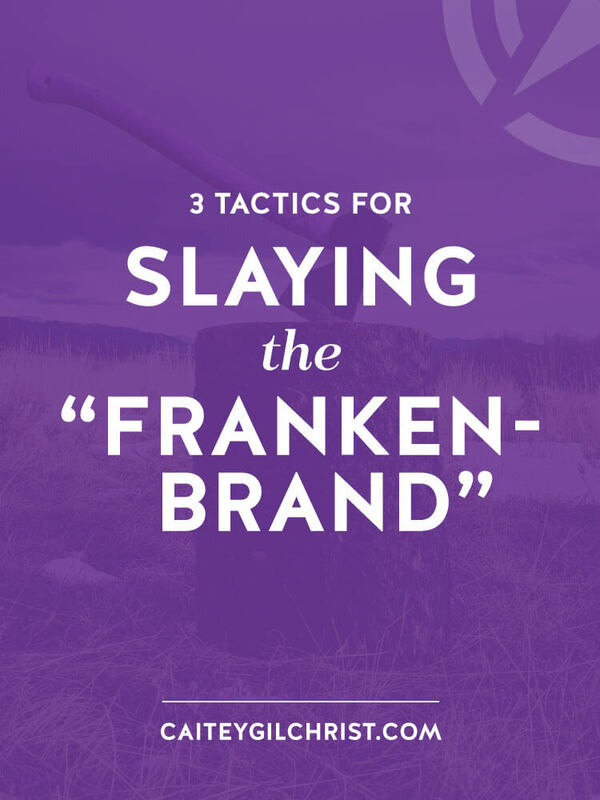 With a plan, guideline, and audit in your back pocket, you’re well on your way to slaying the Frankenbrand. Did you discover a tactic that’s missing from your overall brand strategy? Set some time this week to review, edit or create an element that will help you with your Frankenbrand! To discover more authentic branding tips, follow me on Facebook and Instagram at Caitey Gilchrist Creative.